If you’re a teacher, a parent or (God bless you) BOTH, you’re guaranteed to have a million and one things to do. As Silly Fish enters its second year, we’re trying to plan all the things we want to do in the future. Sometimes there can be so much it doesn’t seem doable. A new idea? add it to the list! But is a to-do list or a checklist going to help us become more organized? Lists can be a great way to organize your thoughts. Often I find that there are so many things in my head I become overwhelmed and end up doing nothing. Every small task becomes daunting. Starting seems overwhelming, but of course the longer I put off getting started, the more the list grows and the more overwhelming the task becomes. Are to-do lists the answer? A to-do list can be a great way to get all of those thoughts out of your head. Writing down what you need to do can help you see the problems in bite-sized chunks instead of constantly thinking about the whole jumble. As a bonus, as you cross an item off the list you can visibly see your progress which can do wonders for your mindset and motivate you to keep moving forward. I personally like to write my to-do list on a dry erase board and watch all that space become clear! The problem I sometimes have with to-do lists is that I am known to simply work my way down the list. This means that sometimes I’m not good at prioritizing what really needs to be done and I can get stuck on a big, but long-term goal for too long and manage my time poorly. This often means that things that are more pressing are left a little late and then I’m working on them quickly at the last minute. I’ll be honest, I definitely did that with this article… (it’ll be a miracle if this goes out on the correct day in European time). Can checklists help you avoid the to-do list trap? I read an article not too long ago about how checklists can help you be more productive than to-do lists. If you want to keep making progress at anything, you need to work at it consistently. Now I have a daily checklist and a weekly checklist. 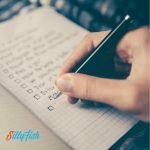 The daily checklist for the blog says things like ‘write a new post’ and ‘pin 4 times’ which help us to maintain a consistent presence and interact with our audience so we know what it is you actually want and need. The weekly checklist has things like ‘send out one mailing list email’ and ‘make one web improvement’ which are less urgent but also need consistency to keep the blog growing. How can you use to-do lists and checklists in conjunction? Sometimes someone would ask for something and I’d reply, ‘I’ve not gotten around to it yet but it’s on the list!’. Well, it was on the list but not on the correct one. Items on my to-do list that didn’t fit in a checklist category could be completely overlooked. Eventually, I added ‘urgent to-do list item’ throughout the daily checklist and ‘non-urgent to-do list items’ to the weekly list. This ensured that I was working my way through both lists in a way that made better use of my time and helped me find balance and consistency in all areas. If you’re like me, it can be useful to prioritize items when writing out the order of your checklists and to review the list every month to ensure you’re keeping it manageable but not lazy. It’s a balance, and one I’m still working on getting right, but I’ll definitely be listing more for our second year. 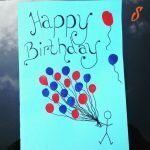 Did we mention that it’s our birthday?